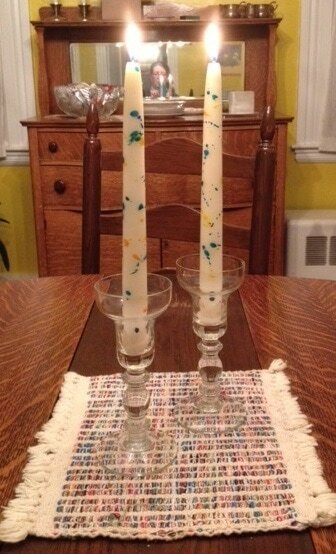 FAT & LUMPY CANDLE COMPANY: BEESWAX CANDLES WITH NON-TOXIC CRAYON DECORATIONS. BOTH THE CANDLES (12" taper pairs) AND THE EMBROIDERED FABRICS (Hand towels, centerpieces, napkins, pillows, table runners, etc.) ARE ORIGINAL, ONE-OF-A-KIND HANDMADE DESIGNS. ALL ARE AVAILABLE FOR SALE.